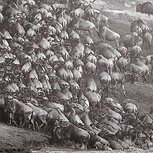 Way up among the great wildlife spectacles of the planet is the annual migration that occurs in the Masai Mara – the river crossings of the vast numbers of wildebeest being the dramatic peak of this amazing annual event. The private luxury camp at Entim, inside the park itself and where we will be based for this trip, will place us right at the heart of the action as the camp is based right next to one of the river crossings so there’s every chance one could occur literally on our doorstep. As if this mass gathering isn’t enough there is the added drama of crocodiles lying in wait for the crossings themselves. It won’t be the sole focus of the trip though as we will have plenty of opportunities to photograph the famous prides of lions, cheetah, leopard, elephant and with luck black rhino as well as the dramatic settings that the Mara has to offer: every day is more than capable of delivering something totally different and equally special here. This will be a photographic safari to remember on which we will work with a whole row of seats per photographer in each vehicle to ensure you the best of the many encounters we will have. Days 3-7: We will look to make the most out of each of these full days we have to photograph in the Mara. This is a setting that has the highest density of wildlife in Africa, and with this trip coinciding with the peak of the migration season there will be over 1.5 million wildebeest giraffe and zebra around us along with the Masai Mara’s justifiably famous big cats with lion, cheetah and with luck the more elusive leopard in good densities and offering the chance for some great encounters. The possibility of serval, plenty of hyenas, birdlife including secretary birds and tawny eagles and the diversity and potential on offer is endless for every drive. 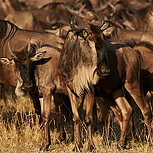 Looking for the drama of a wildebeest crossing though will be our main priority as this has to be one of the most amazing spectacles in the natural world. Our camp embraces one of the main crossing points, so we might even be lucky enough to witness a crossing whilst at base. Each morning we will embark on our first drive at 6.00am and will continue until around midday or longer dependant on animal activity with a short break for a light breakfast and refreshment during this outing. Every photographer will have a whole row of seats on each drive, ensuring ample space and flexibility for photography. On returning to camp there is time for lunch, a short rest, downloading images and time for some advice on your images and processing as you wish. We will return to our vehicles for an afternoon drive at 3.30pm and return at 6.00pm to again look to relax by the camp fire with dinner at 7.30-8.00pm and no doubt with images also to be discussed and compared as well! Day 9: Arrive home that morning after our overnight flights. Costs are based on a twin room sharing basis with single supplements potentially available on request.